With a passion for helping others and a modern approach to sharing the oils, Sarah Harnisch made it to Platinum in Young Living in 17 months. 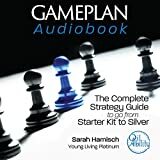 Now she’s sharing her strategy in this densely-packed guide to take you from starter kit to Silver in Young Living. Understand the chessboard of network marketing and get practical advice for every aspect of your business. The audiobook includes scripts for classes, training leaders, invitations and closings, and duplicable systems to help you fill classes without knowing people, share the oils compliantly, follow up with confidence, and build strong leaders. Learn to boldly run your Young Living business without sounding like a sales pitch. It is time to grow!